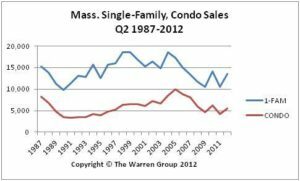 Massachusetts single-family home sales increased again in June, climbing to the highest level for any month in two years, according to the latest report by The Warren Group, publisher of Banker & Tradesman. Single-family home sales rose almost 26 percent in June, the fifth straight month of double-digit percentage increases. A total of 5,498 single-family homes sold in June, up from 4,368 a year earlier. This marks the best month for sales since June 2010, when there were 5,662 sales. Second quarter home sales totaled 13,560, a 28 percent increase from 10,595 in the second quarter of 2011. Year-to-date home sales statewide are up 24 percent. From January to June, a total of 21,567 single-family homes have sold, compared to 17,397 during the same period a year ago. “A month of nearly unchanged prices is a promising indicator that buyers are beginning to re-enter the market, and downward pressure on home prices is abating,” Warren added. 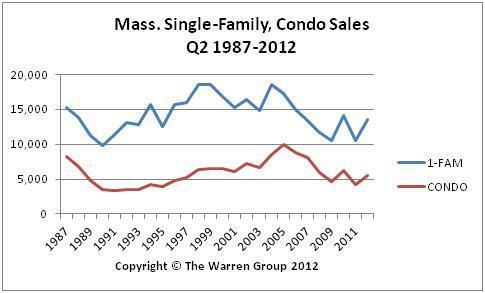 Bay State condominium sales also rose in June, increasing almost 29 percent from a year earlier. A total of 2,216 condos sold in June, up from 1,723 a year earlier. Year-to-date condo sales are up 23 percent to 8,568 from 6,950 a year earlier. Condo sales for the second quarter also climbed from a year earlier. In the second quarter, 5,507 condos sold, up more than 31 percent from 4,184 during the same period a year ago.